Very peaceful and quite apartments with the sound of sea waves in your room. We enjoyed absolutely everything about the place – wonderful location, comfortable and clean room, warm sea and romantic sunsets, good taverns, bakeries and little supermarkets nearby. It was nice and easy to travel from Rovies to Drimona waterfall, St.George Monastery, Limni, Edipsos. However, the most precious part of any journey for us is people! And Greek people are our favorite :) That is why we keep coming to Greece every summer :) Stavroula and Yannis are the most welcoming and hospitable hosts. We miss them already and will definitely come back! Great thanks for making our Evia vacation so special and unforgettable! The sound of the ocean, the hostess, the kitchen. We’d return... lovely quiet village, but accessible by public transport. Our balcony was right in front of the sea. You just have to descend to have a swim. Beautiful view on the coast at the other side. erfect ly calm, very nice hosts. The village has a square that is pleasantly busy at night with plenty taverna's. Very recomandable. Sleeping and waking up to the sound of gentle waves was peaceful and relaxing. Our hosts were very informative and lively! A real pleasure! Clean bed sheets,gave us extra towels for swimming. The see view is very beautiful. The sound of the sea waves could be heard into the room. Der freundliche und persönliche Empfang, die Lage direkt am Meer und die Aussicht auf der Seite des Hauses erlaubt einen Blick in die Berge und aufs Meer. Die Küche erlaubt es mit einwenig Phantasie etwas kochen zu können. Lock in a great price for Georgiou Apartments – rated 9.3 by recent guests! Located in Rovies, Georgiou Apartments is set right on the beach. 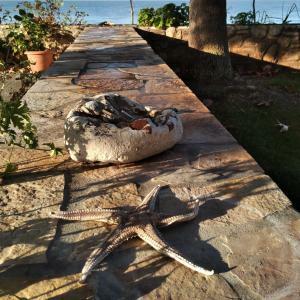 Featuring a lush garden with flowers and plane trees, and offering self-catering accommodations with views of the Euboean Gulf, the accommodations is 13 mi away from Loutra Edipsou. Free WiFi is available in all areas. There is also a kitchenette, fitted with an oven. A refrigerator and kettle are also featured. There is a private bathroom with a shower and a hair dryer in every unit. Bed linen is offered. Free sun loungers and umbrellas are offered on the beach. Guests will find restaurants, mini markets and cafes within 1,000 feet from the property. The Monastery of Osios David Gerontou is 8.1 mi away, while Agios Ioannis Rossos Church is at a distance of 25 mi. Free private parking is possible on site. The nearest airport is Athens International Airport, 114 mi away. When would you like to stay at Georgiou Apartments? This 1st-floor studio features a balcony, electric kettle and kitchenware. This 1sr floor apartment provides sea view. House Rules Georgiou Apartments takes special requests – add in the next step! Georgiou Apartments accepts these cards and reserves the right to temporarily hold an amount prior to arrival. Please inform Georgiou Apartments of your expected arrival time in advance. You can use the Special Requests box when booking, or contact the property directly using the contact details in your confirmation. We booked 2 apartments for 3.On arrival we found that we all could fit in one apartment as the description of one of the apartments did not show that one room is private with the door.But the owners was sympathetic to us and gave us late check out till one pm for the the bigger apartment. Slightly old fixture and fittings but this is all part of its charms. Nothing I did not like. Comfortable and clean. Beautiful sea view.